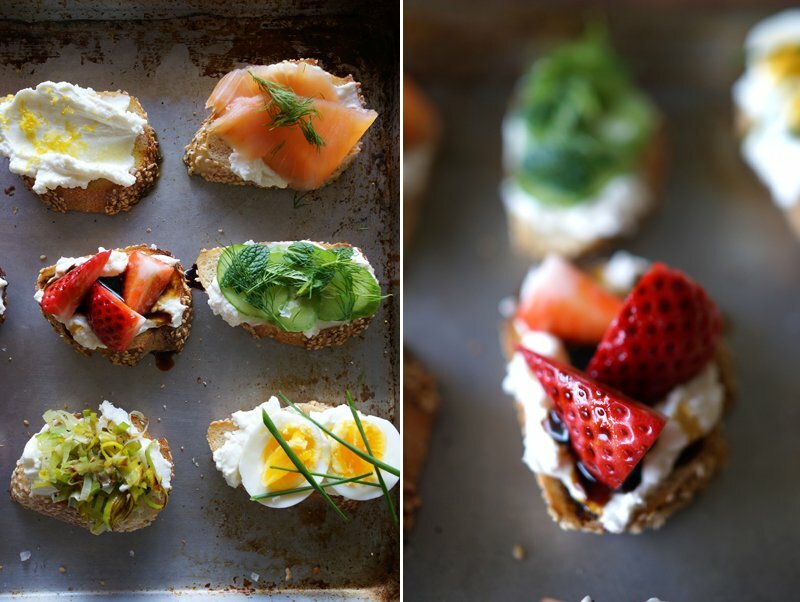 Crostini are the ultimate party food and a ricotta crostini is the perfect blank canvas to show off both savory and sweet creations. 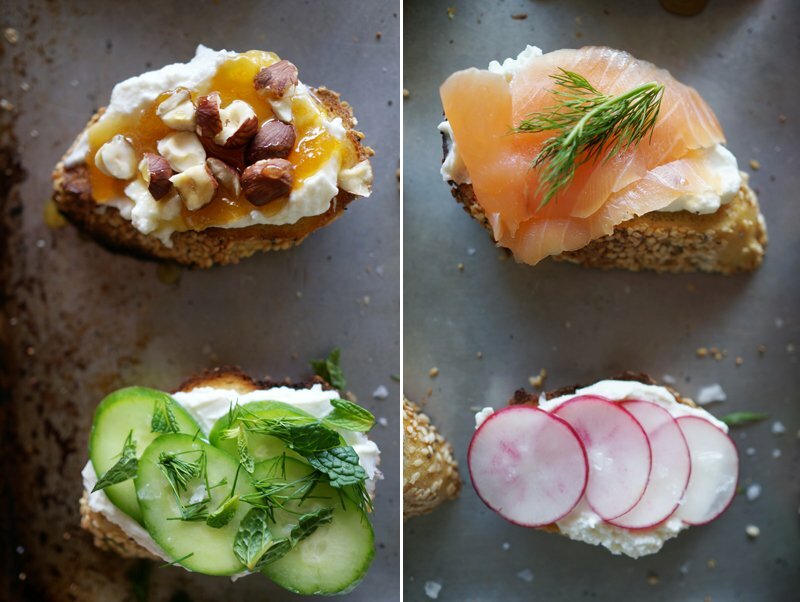 The wonderful thing about ricotta crostini is that fresh ricotta can be made a day ahead. This is a smorgasbord of some of my favorite flavor combinations, but the possibilities are endless! Making ricotta crostini for a large party is simple. Buy a fresh loaf of bread and slice into 1/3 inch thick slices. Toast the slices and once they have cooled a bit slather them with ricotta. Then top with whatever ingredients you like. For me, the key is using high quality ingredients, such as good extra-virgin olive oil and sea salt– I love using Maldon sea salt or fleur de sel. This will really make your other ingredients sing! 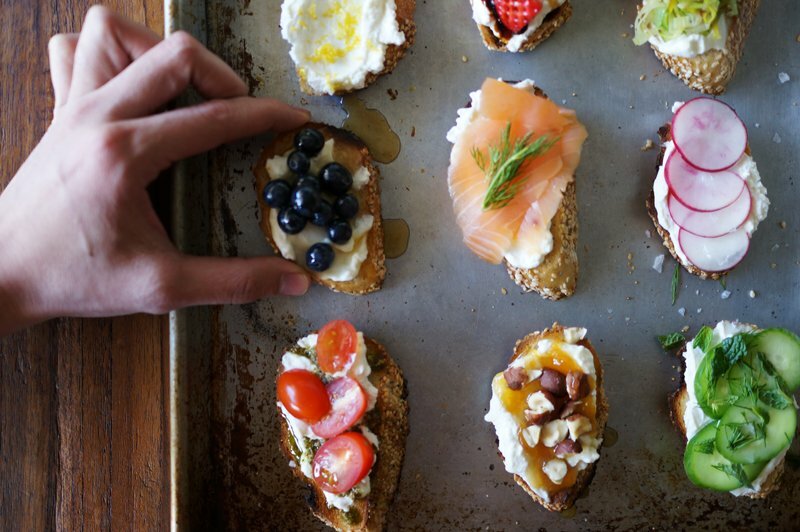 A simple ricotta crostini can be topped with a variety of ingredients from sweet to savory. To make the caramelized leeks, split one leek down the middle and run under water to remove any dirt. Slice the white and light green parts into half circles. Heat a tablespoon of butter and sautee the leek until caramelized. Add a pinch of salt. 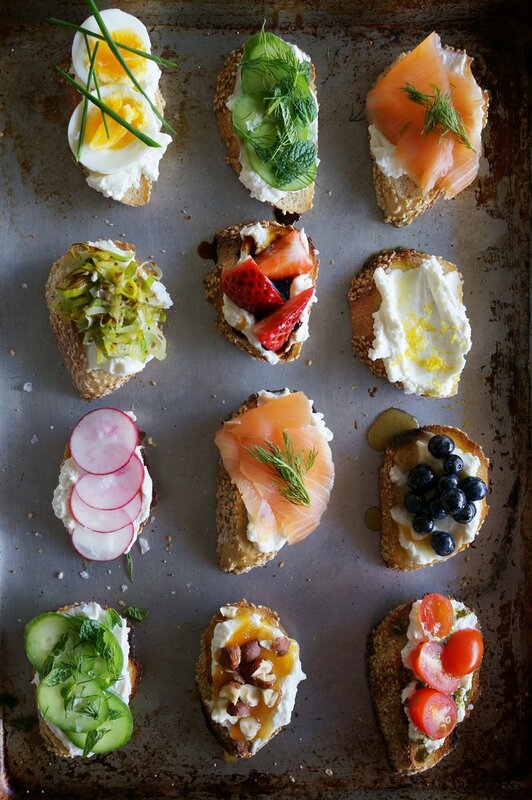 Slather on ricotta and divide the ingredients under each type of ricotta above evenly onto 4 pieces of crostini. Top the savory ones with a little extra flake sea salt. I love ricotta and these feelings look delicious. these look delish!!! do you have any suggestions for some with cured meats like prosciutto and the like? seems like you are THE person to ask 😀 hosting a party this weekend!!! I’m in love with this photo. Every Time it passes in my Pinterest feed I admire it again. Great job! These look amazing!!!! How far in advance could i make these ? If party is an afternoon party, would they last a few hours or get soggy. So excited to try them! I would prep the ingredients ahead of time and keep in containers and then assemble right before your party that way the bread stays fresh! YUM! This is a fantastic and quick way to dress up a garden party. I’ll be repinning this to pinterest/homedepot “Garden Party” pinboard. Thank you for the inspiration. Give me several of the first one in the second row! If you use a clean plate, it will look better. Fabulous images! What a perfect spring dinner, I want them all!! I love homemade ricotta and this picture explodes with ideas!!! What a great party food idea!! Love it! Mmh I would take one from every kind!! They are all looking fantastic. The most exciting however is the hazelnut and apricot jam one! Looks like a lot of fun. 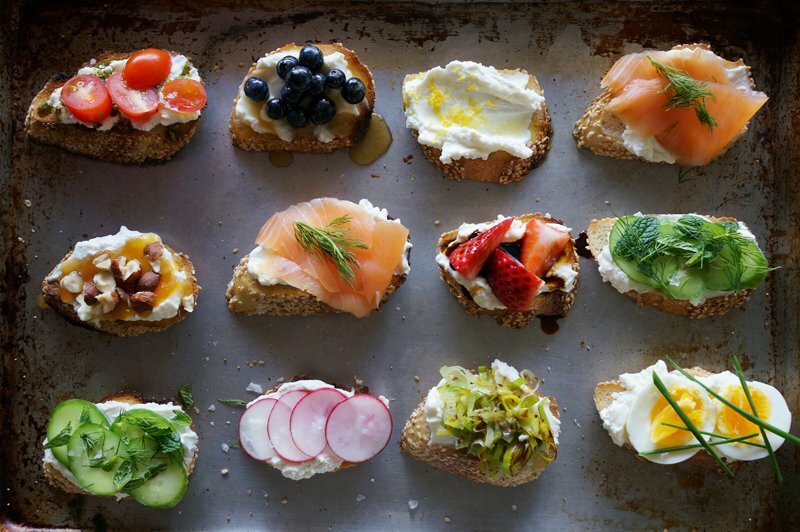 Even more so, if you prep the toast and arrange it on a buffet with a bowl of ricotta and a variety of toppings for guests to mix and match as they like. Honey, hazelnuts and cracked black pepper is another nice topping combo not mentioned above. This type of post has been on my to-do list for a while and you’ve certainly given me inspiration! Gorgeous pairings. Now where’s my Prosecco? Holy hell, give me the one cucumber mint one…I mean give me the strawberries and maple syrup, I mean make ’em all for me now please. And I will take a nap afterward. Ah, and the picture is so beautiful! I am coming to this party for sure!!!! This looks incredibly delicious. And the ingredient combinations are so simple. I can taste it right now! Thanks! Next time I entertain, I am making these. They look amazing and so simple! Super Bowl Party Snacks and Starters with a Gourmet Twist!